In my last post I had to list 10 things about me to accept an award. I happened to mention I have a weird thing about numbers and it seems a few of you do too. Random Fact #7: I also consider 25 to be an even number coz you can double it to get an even number and it's a quarter of 100...weird and totally not logical reasons I know...I just have a weird brain! In addition to all this I have a thing with dates. I like my dates to be even numbers or multiples of things. For instance, Mr.P and I started going out 02.08.02 (totally coincidental, but 2's figure a lot for me) and got married 02.08.08. We got engaged 11.11.06. my birthday has 2's or multiple's of 2 throughout, and to be honest, I don't really want to have a baby in 2011. It's an odd number. My friends have laughed at me for this, because I'm so clucky, but it's not just about it being an odd number year. I also don't want to have a baby in the first 4 months of next year, but I also don't want a baby in the last 8 months of the year, as there are too many birthdays then. So it works out well that we can try to have a baby around the beginning of 2012, which means it's an even number year. To be honest, I don't really care when my baby is born, I just wanna have a baby. But an even year, and the year I turn 30 (but before I turn 30) would be nice! Am I asking for too much? Lol! I don't like the number 3. Don't ask me why, I don't really have an aswer. I don't like the way it looks. Or sounds. I suppose those are reason. Oh, and bad things come in three's (I'm not a superstitious person, but more often than not they do seem to come in three's. Maybe coz I'm looking for it though). What numbers do you love or hate? Are you an even or an odd advocate? Or do you think I'm just mad?!?! I totally get this post! My favourite number is 21 as well (but my birthday is the 26th) and I really don't like odd numbers either. I think, too, it's because my birth date, month and year are all even. My husband are all odd, which is better to me than some odd, some even. My kids were born in 2004 (good) and 2007 (not so good) but number 2's birth date is 08/09/07, which if you write it the American way is 09/08/07 and that's cool because it's at least a pattern. I understand your feelings towards numbers as well, though perhaps not to the same extent! My fondest memories are from the even years of my life, excepting only a couple of years. I'm 26 at the moment and believe it to be a good age. I didn't like 25. I worry that I'll be 27 when I'm married, only 3 days off 28. In saying that, though, my favourite numbers are 7 and 13. So I've just shot my whole theory to hell. You're not mad. I remember listening to an interview about peoples associations with numbers. Some people also see different colours when they think of days of the week or hear musical notes. I wish I could remember more but at 11:36pm my brain has gone squishy. Odd numbers rule! I won't use any golf balls with an even number on it except #2 (which is prime.) Half the box of balls get hit into water hazzards and off cliffs. 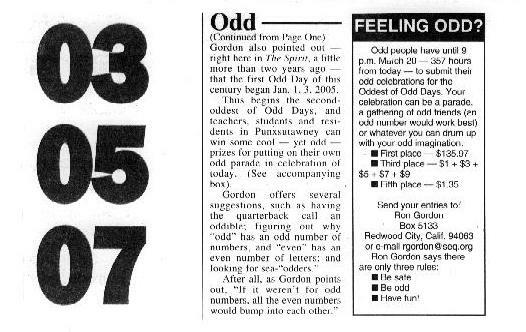 But you can double any odd number to get an even number. I can understand the illusion that 21 and 25 are not odd numbers because they are such clear multiples of 7 and 5 respectively. In fact, the aversion described sounds a bit more like a distaste for prime numbers more than specifically odd numbers. 2 is the only even prime number, for fairly obvious reason. Beyond that, 9 and 15 are the only odd numbers under 20 that are not also prime numbers.